The Department for Transport and the Centre for Connected and Autonomous Vehicles have opened a consultation intended to enable future use of autonomous car parking and motorway active lane keeping technologies. 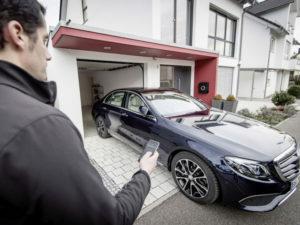 The regulatory changes would open up the use in the UK of remote control parking technology on models such as the Mercedes-Benz E-Class. Although the Government is trying to expedite developments to make the UK a global leader in connected and autonomous vehicles – with this year’s Autumn Budget having seen the Chancellor outline plans for fully self-driving cars to be on UK roads by 2021 – regulatory changes are needed to ensure such technologies can be used on UK roads. This follows the adoption of international standards incorporating this technology, along with increased scope for motorway assistance systems, in October 2017. The proposals include amending Regulation 110 of the Construction and Use Regulations to permit the use of hand-held and mobile communications devices as a means of performing remote control parking manoeuvres. This would mean drivers would not break the law when using such technology. The regulation currently states: ‘that no person shall drive a motor vehicle on a road if he/she is using a device, other than a two-way radio, which performs an interactive communication function by transmitting and receiving data’. However, remote control parking is enabled by using either a bespoke device or an app on a smartphone, contravening the current regulation. The amendment would only apply to hand-held devices used for remote controlled parking function of the vehicle and would require the device to only work if continuously activated and if the distance between the vehicle and device is not more than six metres. Future changes are expected to need to take into account the likelihood that the vehicle could be out of the driver’s sight while the parking manoeuvre is completed. The proposals also include draft amendments to the Highway Code. These include changing rule 149 on not using a hand-held mobile phone, again to enable remote controlled parking (RCP), and revising rule 239 on off-street parking to ensure drivers carry out RCP quickly and safely. The proposals would also introduce changes to the Highway Code rules 150 and 160 to ensure the legal and safe use of motorway assist and remote control or automated parking. The consultation will run until 30 January 2018.